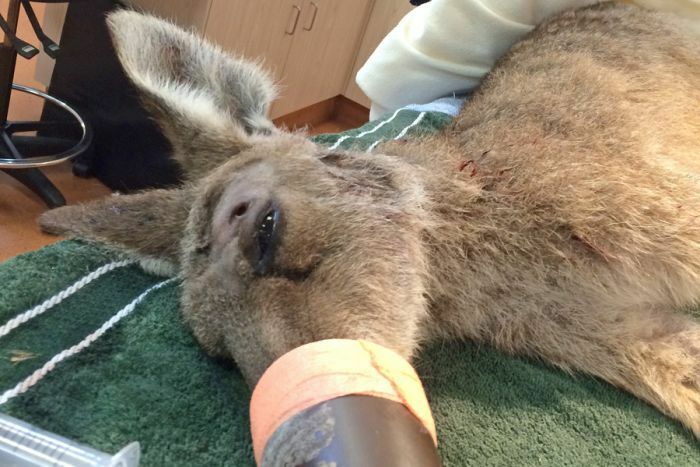 A female kangaroo has survived for four days with an arrow stuck in her head after being shot in Queensland, Australia. The mother kangaroo was finally captured north of Brisbane on June16. She was also carrying a baby kangaroo, Australia Zoo said in a statement. Doctors performed surgery to remove the arrow, which came very close to her skull and brain. The kangaroo and her joey (baby) were released back into the wild after the operation. She was captured by Australia Zoo and the RSPCA near Toorbul and taken to the Australia Zoo Wildlife Hospital for treatment. The arrow “actually grazed the skull and came millimeters from her eye socket and optical nerves”, the Australia Zoo statement said. According to the statement, the kangaroo was sedated from when she arrived until when she was released back into the wild. “She wouldn’t have even known she was there, but she will be waking up in the wild much more comfortably without the arrow,” the statement said. RSPCA Queensland spokesman Michael Beatty urged anyone with information on the case to contact it on 1300 852 188. Michael Beatty said in most cases animals shot with arrows either died a slow death or lived long enough to be rescued but ultimately had to be euthanized.